Maria's Space: National Tattoo Week Was April 13-18 - Did You Get A Tat? National Tattoo Week Was April 13-18 - Did You Get A Tat? National Tattoo Week is April 13-18. Tattoos are a big business and as tattoos age, maintaining them has become a big business, too. That’s why TAT TOWELS were invented. 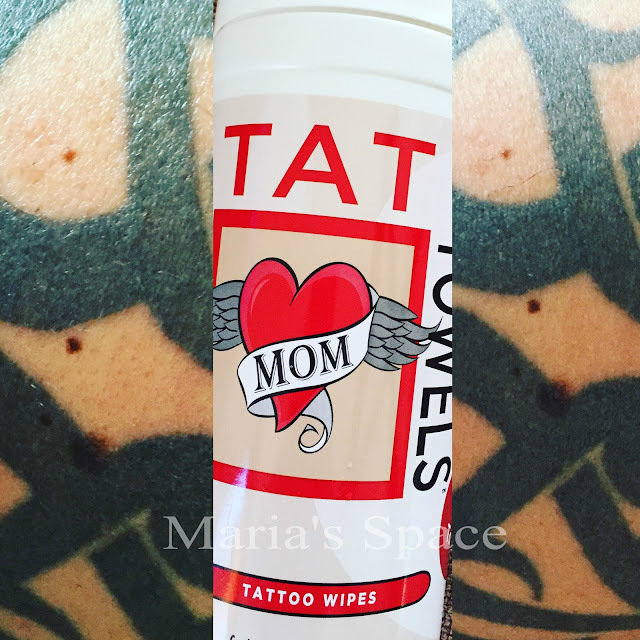 TAT TOWELS are a brand new product formulated to moisturize and care for all tattoos and rejuvenate older tattoos that are starting to lose their luster. Created by Body Wipe Company, a provider of personal care wipes, TAT TOWELS are specially formulated with white mineral oil, pomegranate, cranberry and grape seed oils and other ingredients to provide an easy, non-greasy way to maintain tattoos. What makes TAT TOWELS unique? TAT TOWELS retail for $9.95 for a package of 40 wipes and are available at www.tattowels.com. TAT TOWELS are not intended to be used as an immediate tattoo aftercare product, as they are not anti-bacterial, anti-inflammatory, or an antiseptic. TAT TOWELS formulation will not stain or become sticky after application. Co-founders, Joel Saban and Jim Bahcall took their previous company, Paper Shower, LLC, that started in 2010 with a single Paper Shower product and over the years significantly expanded its personal care wipes product line. With this expansion into various wipe markets, the company needed a new name that best represented this growth and diversity of personal care wipes. So in 2016, Paper Shower, LLC was renamed Body Wipe Company, while still keeping their popular Paper Shower product line. Joel and Jim continue to bring innovative and quality personal care to their customers…one wipe at a time!